I caught up recently on a debate about S&P 500 valuation involving GMO, Hussman Funds and their assorted critics (see here or here, for example). 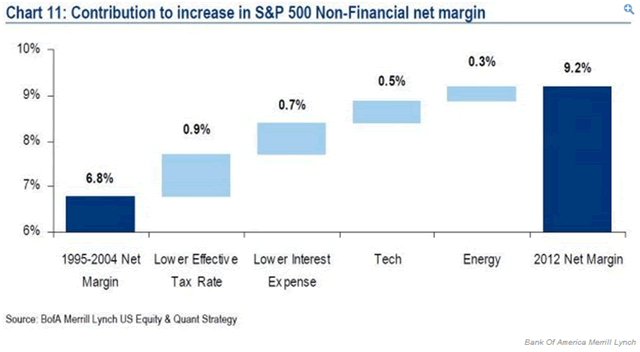 As you may know, GMO and Hussman take the position that stocks are expensive, citing a variety of indicators and arguing that profit margins should “mean revert” from record highs. On the other side, market bulls dispute the indicators and propose that fat margins are no big deal – they might just remain at record highs indefinitely. “High margins reflect a long-term structural change, not a short-term cyclical one,” according to one account of a popular position. The message seems to be that mean reversion is for losers. This is a new era, or it’s a new economy, or whatever. I’m paraphrasing, but the story sounds a lot like the capital letter New Economy of the late 1990s. There’s even a technology angle once again, along with huge confidence in monetary policy and recession-free growth. Above all, there’s a notion that the world might be different. What exactly is mean reversion? Most of the variation in margins is explained by cyclical and other temporary factors, although structural trends can occur. Cyclical changes pass through roughly the same range of values in both directions for long periods of time. Why should profit margins mean revert? It goes without saying that the ups and downs of the profit cycle are closely tied to the business cycle. But cyclicality isn’t enough to meet all the criteria above, which require that cyclical changes aren’t overwhelmed by structural trends. There are two other forces that keep the structural trends in check – external and internal competition. External competition – meaning between businesses – is the most obvious of the two, and ever since Adam Smith, isn’t especially controversial. Businesses are naturally more eager to invest when profits are strong. This leads to more competition, less pricing power, and eventually, margins are pushed downwards. The implication is that there’s a close link between margins, which help determine the return on capital, and interest rates, which determine the cost of capital. It’s hard to imagine a “new economy” for margins without a corresponding “new economy” for interest rates. (But, as noted above, we’re going to try). Internal competition refers to the conflicting interests of executives and shareholders, otherwise known as agents and principals. Executives may evaluate potential expenditures in terms their own power or prestige rather than what matters most to the shareholder – return on capital. Generally, executives also like to be paid as much as possible and tend to make hay when the sun shines. When margins are fat, they loosen the purse strings for pet projects, and especially, compensation. They normally manage to claw back some of the shareholders’ profits. This is the classic principal-agent problem, and it contributes to mean reversion. The chart suggests that the increase in margins can be divided up neatly into a few factors, including a decline in effective corporate tax rates, low interest rates and good times in particular sectors. This is helpful information for anyone trying to understand recent results and how they may change in the immediate future. But it doesn’t say much about mean reversion. Apart from the business cycle, mean reversion is explained by competition occurring between and within businesses, as discussed above. It has little to do with current taxes and interest rates or booms in specific sectors. Therefore, even though the chart may depict changes that are structural in a general sense, such as the decline in corporate tax rates, it doesn’t describe changes that have structural effects on margins. Look at it this way: Let’s say Congress eliminates every tax loophole tomorrow, tripling the average tax rate on U.S. corporations. Margins would fall sharply, no doubt. But does anyone really think the effect would be permanent? That businesses wouldn’t raise prices and/or cut costs to neutralize the higher taxes? And if you accept that businesses adjust to rising tax rates, why wouldn’t they adjust to falling tax rates? If shareholder advocates have learned as much about incentives as Munger, they may have mitigated the principal-agent problem, and consequently, boosted margins. If so, this would be a structural effect. Is the story true? On the one hand, you might argue that there’s more equity-linked compensation than, say, in the 1980s. This would better align principals with agents. On the other hand, there’s also more dilution. Stock options are a great way for executives to grab a bigger piece of the pie. Call me cynical, but I’m guessing these effects offset. More broadly, I expect margins to gradually succumb to temptations, as they always do. When earnings are strong and stock prices lofty, empire builders get busy and pay negotiations become more aggressive. At the same time, you don’t hear as much from the folks who are naturally cost conscious. These facts of life aren’t easily overturned by corporate engineering. Judging from the crony capitalism chronicled in Lewis’s book, you might wonder if profit margins are high because they’re protected by corrupt politicians. There’s no better way to build a moat than through government-sanctioned advantages, and companies spend more money lobbying for those advantages than ever before. Think of it this way: The invisible hand may squeeze margins, but the invisible handshake works in the opposite direction. Sadly, I suspect there’s some truth in this story, but it’s unlikely to be either a large effect or especially bullish. One obvious offset to the positive effect on profits is that cronyism saps productivity over the long-term. Another is that the gains don’t necessarily accrue to shareholders (see “Munger” story above). I don’t even know what a bubble means. These words have become popular. I don’t think they have any meaning … [A]lmost surely, expected returns vary through time because of risk premia. - Nobel Prize-winning efficient markets advocate Eugene Fama. When assets appear to offer unusually high returns, Fama would say that investors see unusually high risks. By the same logic, you might argue that extreme margins aren’t being competed away because it’s a lousy environment for risk-taking. I won’t repeat the reasons why this may be so, since I discuss them often. I’ll just point out that margins are high partly because of the same risks that are holding back business investment, which I discussed here. Of course, business investment also affects margins more directly by raising costs, and this is another factor to consider. One way or another, the co-existence of strong profits and weak business investment seems best explained by risk. These trends could persist, but it’s not a particularly bullish story. If you’re keeping score, you’ve noticed that I mostly dismissed the first two stories but not the third. Essentially, I’m arguing that we may indeed be witnessing a new economy, but the newness isn’t explained by profit margins being structurally higher than before. They may be somewhat higher, but probably not by much. Rather, newness is explained by attitudes towards risk, which perhaps isn’t surprising if you consider that today’s extreme highs in profitability were preceded by extreme lows at the last trough. In fact, increasing volatility is what stands out most in the last two decades of data. Moreover, even bulls accept that there’s little potential for further margin expansion. Such asymmetry of risks – high probability of an eventual fall in margins coupled with little chance of a significant increase – is another way to think about the consequences of mean reversion. Circling back to the Business Week excerpt from the beginning, I saved the Alan Greenspan article after reading about it in Robert Shiller’s Irrational Exuberance, where he shares research into a variety of historic market bubbles. (What, you mean I’m not the first person to balance out Fama with Shiller?) Shiller stresses that pundits can be “especially creative in telling stories of why a new era [is] dawning.” Based on the current valuation debate, it’s hard not to wonder if today’s profit margin bulls are gunning for a spot in the next edition of Shiller’s book. This post is already too long for a full investment discussion, but I’ll close with a few points that I think are important. First, profit margins are unlikely to determine stock prices in the next quarter or year. For tactical investors with short horizons, the biggest questions still have to do with the Fed, and specifically, its reactions to changes in the economy. Does weak data mean that the taper tapers or untapers or however that should be said? Does strong data mean that rate hikes come sooner rather than later? Does QE mean revert? Okay, the last one may or may not make sense but you get the idea. Second, mean reversion isn’t the same as valuation. Of the indicators used most often in the valuation debate, I can’t think of any that assume margins return to long-term historic averages. Most don’t require any assumptions about future margins at all. I’ve even reported a price-to-trend-earnings measure that can have the effect of extrapolating an upwards margin trend into the future, rather than reverting it back to historic norms. Third, the margin discussion is ultimately about risk, as suggested above. Some analysts have recommended ignoring risk and contemplating only future cyclical peaks for indicators such as margins and valuation multiples. This may be okay for investors with the ability and foresight to liquidate only near market tops. Unfortunately, the vast majority of investors aren’t quite that deep-pocketed and skilled. For most investors, cyclical troughs can be costly and risk matters.